Writing, particularly wine writing, is a tricky business folks (so leave it to the professionals!). If you try to be even vaguely journalistic (hey, that's like pretty much all journalism these days!) and reach out to people with questions, sometimes the story you finally end up writing doesn't include some of your sources, however perspicacious he or she might have been when giving you answers. So, while I've been doing some reporting on Santa Barbara Vintners Road Trip LA--see my post on a wine dinner with unusual varietals and my blog on the state of Bordeaux varietals in SB--I never had a good spot to include a fine Q&A with Larry Schaffer, owner and winemaker of tercero wines, and one of the most indefatigable proselytizers for Santa Barbara County. 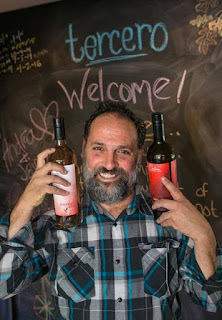 I have to admit, I'm sorry I missed him pouring at both the Rhone varietals day and at what sounded like an amazing BBQ at Rose Cafe in Venice featuring, of course, rosé wines. That said, here's what Larry said in response to a few leading questions. George Eats: What does LA need to know about SB County Rhone varietals? Schaffer: What I want LA to know about SB County Rhone varietals is that we actually excel at producing balanced, food friendly versions of the majority of the 22 varieties that are considered Rhone varieties. And just as importantly, I want the folks in LA and beyond to realize that Santa Barbara County is NOT synonymous with "Central Coast"--the former is our county alone whereas the latter stretches from the San Francisco Bay to Ventura. It encompasses Monterey, SLO, and Santa Barbara counties, among others, each with our own distinct characteristics. I'm really pushing for the "Central Coast" moniker to be underplayed at this point and for folks to use Santa Barbara, SLO, etc. to talk about specific areas. George Eats: Is that different from what EVERYone needs to know, and if so, why? Schaffer: Yes, in the sense that LA is somewhat our grape growing region's backyard--but sometimes it does not feel that way. It appears that most folks in LA and Orange County, given the choice, are predisposed to driving to Paso or flying to Napa as opposed to coming to Santa Barbara County. And I believe that is our fault as a region--not being active enough in the area as a whole to educate LA from top to bottom what our region has to offer. And this road trip is a great start to hopefully changing that viewpoint. Schaffer: I will be taking part in a seminar for the trade and media on Wednesday, and at that seminar, I will be pouring my 2011 Grenache from the Larner Vineyard in Ballard Canyon. I will also be pouring my 2015 Mourvedre Rosé, my Greanche Blanc, my Mourvedre and probably a few others, if I can sneak them in :-) I'm hopeful that attendees will approach the tasting with a desire to learn about varieties they may not be familiar with. I'm confident that they will come away quite pleased at their discoveries. And I also want to educate them about the Rhone Rangers organization, of whose Santa Barbara County chapter I am President. George Eats: How else can Santa Barbara "take-over" LA? Schaffer: As mentioned above, this is a great start, but simply that--we as a region need to keep our pedal to the floor and continue this process each and every year, just as other counties from throughout CA and beyond do. One of the "blessings" in this challenge is that the wines and experiences they will have here in Santa Barbara County are top notch--we just need to alter and create new perceptions and market better to our potential visitors! And by experiencing our wines more often throughout the LA area, they will see this quite clearly.